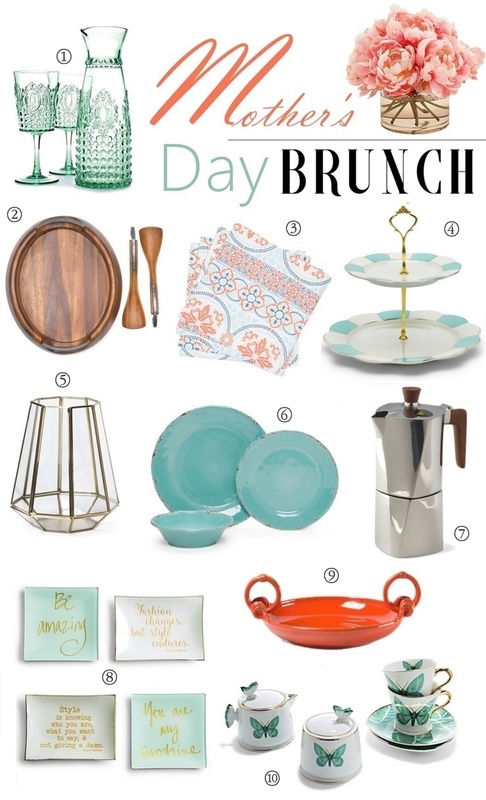 Mother’s Day is all about brunch, right? I mean what’s better than waking up to an egg white frittata with a side of french toast and mimosa? MMM... I can taste it already. But Mother’s Day brunch is not just about what you whip up in the kitchen, it’s also about creating a gorgeous spread that makes mom feel extra special. This year, honor her with unique finds from Marshalls and & T.J. Maxx. They’re two of my favorite stores to find stylish pieces for the home and perfect for creating a gorgeous tablescape for lady of the hour! From a delightful cake stand perfect for bite-sized treats, to a charming butterfly tea set to sip on - take a look at some of my favorite pieces that can be found online and in-store. 1. Acrylic Carafe Glasses, $5.99-9.99 at Marshalls.| 2. Anvil Salad Serving Set- $99.99 | 3.Nicole Miller Set Of 4 Ahana Placemats - $9.99 | 4.Cake Stand $12.99 at Marshalls | 5.Three Hands Decorative Glass Lantern - $24.99 | 6. IL MULINO 12pc Patio Crackle Dinner Set - $49.99 | 7. NAMBE Twist Stovetop Espresso Pot - $43.00 | 8. Quoted Plates, $4.99 each at Marshalls | 9. Tuscan HarvestDish With Handles - $49.99 | 10. Butterfly Tea Set, $4.99, $4.99, $6.99 at Marshalls. Adorable mother’s day essentials! The vintage look is simply awesome. Thanks for sharing this post. I will love to make use of these items in my mom’s birthday party. Planning to host it at her favorite venue Houston TX. Thanks for inspirations!